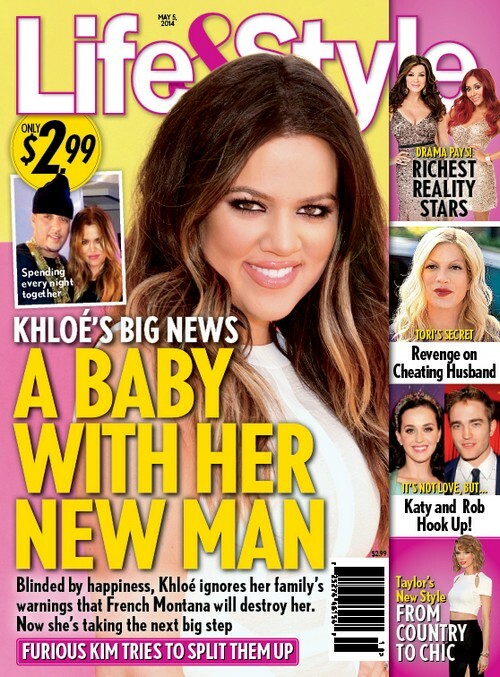 Fresh from her divorce from troubled NBA star Lamar Odom, Khloe Kardashian is currently dating rapper French Montana and yes it's a BIG deal in the world of reality television especially since she hasn’t publicly dated anyone since divorcing Lamar Odom, even though she’s been linked to a few celebrities here and there. Moving on to the news that's actually making the rounds, according to Life & Style’s latest cover issue, Khloe reportedly ‘ignored her family’s warnings’ about dating French and is planning on taking the next step with him after she found out she was pregnant. The report also adds that Kim Kardashian is trying to sabotage Khloe’s relationship with French because she’s jealous that her sister’s relationship is getting so much attention in the media. FYI, Khloe and Lamar tried repeatedly without success to have a baby while they were married and according to some online source, Lamar Odom is devastated & betrayed by Khloe & French’s baby news.